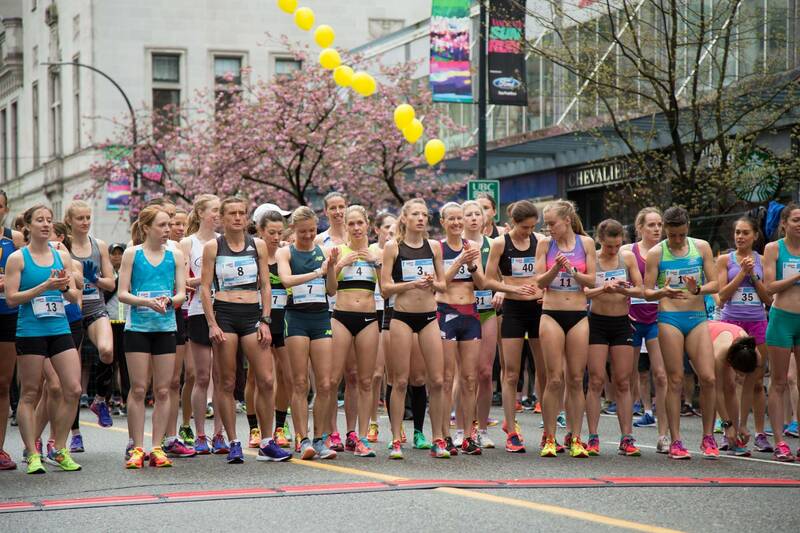 The Vancouver Sun Run has been Canada's largest 10K road race since its inception in 1985. Founded by former Canadian Olympians Dr. Doug and Diane Clement along with Dr. Jack Taunton, the run's purpose was to promote the benefits of running to improve health and fitness as well as support elite amateur athletics. The first run attracted 3,200 participants. Through the years the run captured the imagination and hearts of individuals wanting to improve their health and wellbeing. 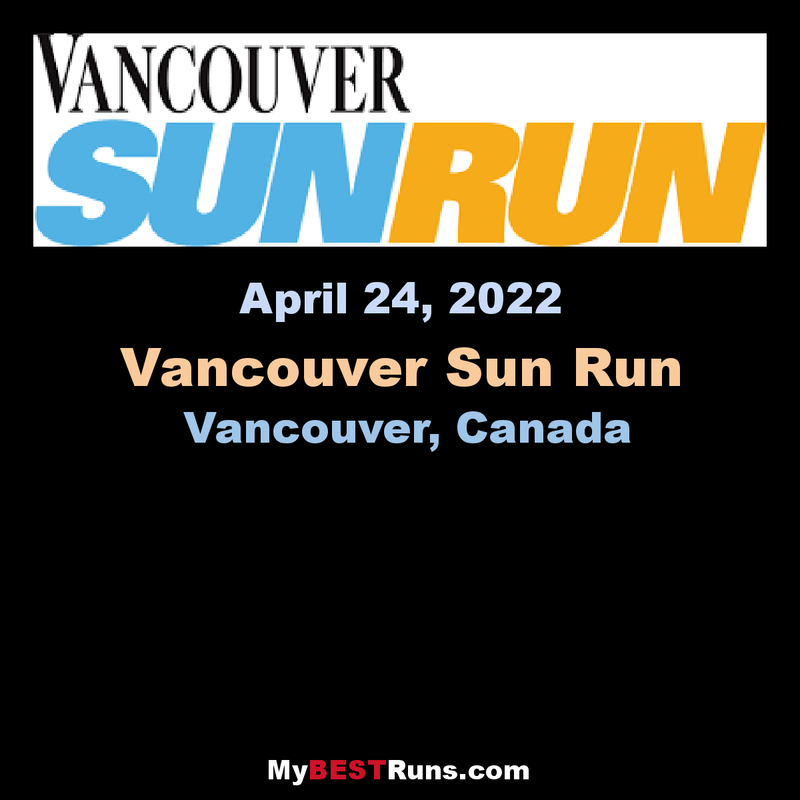 The event morphed into the phenomenon it is today with thousands upon thousands descending upon the streets of Vancouver each year in celebration of Vancouver Sun Run Sunday! The run is supported by its loyal host committee and an army of over 2,500 volunteers. 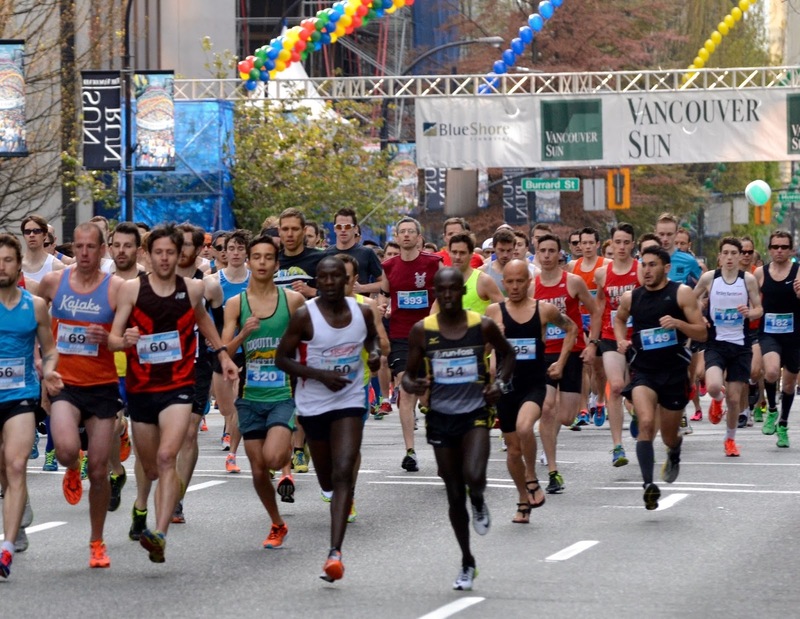 The Vancouver Sun Run is still Canada's largest 10K road race and is now the 3rd largest timed 10K in the world. An incredible 43,372 registrants signed up for the 2016 Vancouver Sun Run event with participants taking in the beautiful Vancouver scenery. 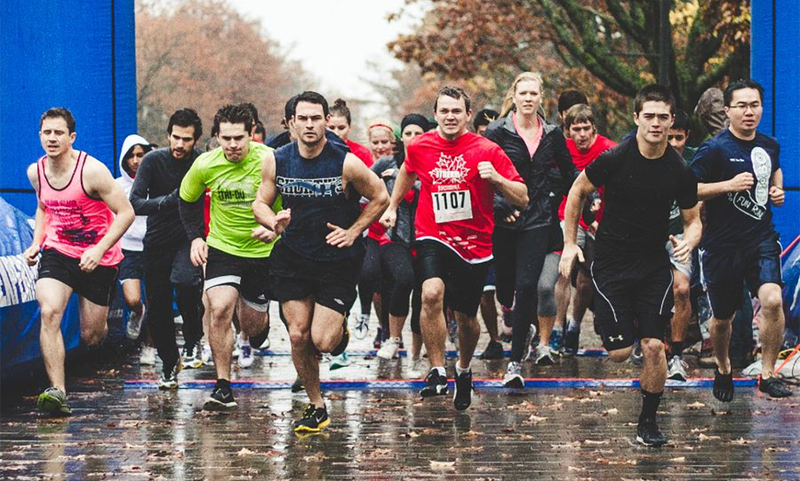 To be Canada's leading and most influential 10K race inspiring healthy, active lifestyles for people of all ages and at any fitness level year over year by offering fun and accessible community-based running/walking event and programs in B.C. 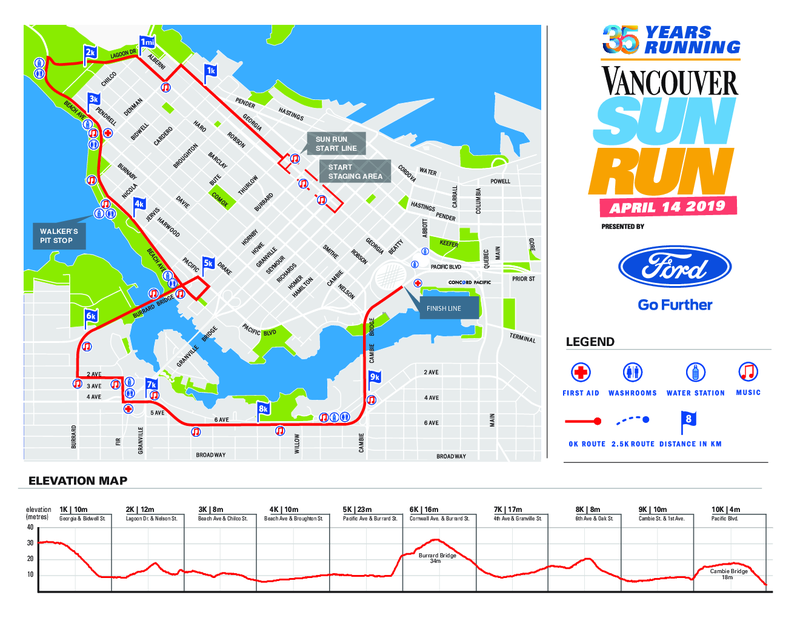 The Vancouver Sun Run is Canada’s largest 10K road race. The 10K route is a beautiful scenic course which begins in Vancouver's downtown core at Burrard Street and Georgia Street. Participants will enjoy the downhill start as they make their way towards the world famous Stanley Park, continuing along English Bay to Hornby Street, then onto Pacific Avenue, across the Burrard Street bridge exiting onto 2nd Avenue. Winding along Fir Street to join 4th Avenue the route continues east on 6th Avenue to the Cambie Street Bridge for the final stretch across the bridge to the finish line. Your Vancouver Sun Run experience does not end just outside our host venue, BC Place Stadium; you are encouraged to enter the stadium to enjoy the wrap party along with your family and friends. The 10K route is sprinkled with gentle, undulating hills making it both fun and enjoyable, while providing breathtaking scenery which includes the snow-capped mountains along Georgia Straight, water views along English Bay and False Creek. The course truly showcases all the beauty of this wonderful city. As typical of other road races, the roads used are completely closed to vehicular traffic and streams of observers watch and cheer from the along the sidewalks. Water stations are provided at numerous locations along the course as well as music entertainment in the form of bands. Due to the large number of participants in this event, the Vancouver Sun Run has a “Wave Start” to begin the event. This type of start is used to stagger the start in order to maintain control of the crowd and ensure the course does not become too crowded.